Researchers from University College London and University of Liverpool analysed data on more than 17,000 children born across the UK in 2000-01, who are taking part in the Millennium Cohort Study. They examined information on children’s height and weight at ages 3, 5, 7, 11 and 14, and parents’ reports of emotional problems, such as feelings of low mood and anxiety. The research took into account children’s gender, ethnicity, social background, and behavioural problems, as well as parents’ mental health. Obesity and emotional problems tended to occur together in mid-childhood and adolescence, from ages 7 to 14, but not in early childhood, at ages 3 and 5. Girls had, on average, higher BMI and emotional symptoms than boys from ages 7 to 14, but co-occurrence and development of obesity and mental ill-health were similar for both. After taking social background into account, the association between BMI and emotional problems was reduced slightly, suggesting that socioeconomic disadvantage explains part of the link between children’s obesity and mental ill-health. However, the association between BMI and emotional problems remained, with obesity at age 7 a risk factor for emotional distress at age 11, and in turn, mental health problems predicting high BMI at age 14. Rates of obesity and emotional problems among children increased gradually throughout childhood and adolescence. Almost 8 per cent of young people were obese by age 14, and around double that number were reported to have had feelings of low mood and anxiety. By adolescence around a fifth of those who were obese also had high levels of emotional distress. 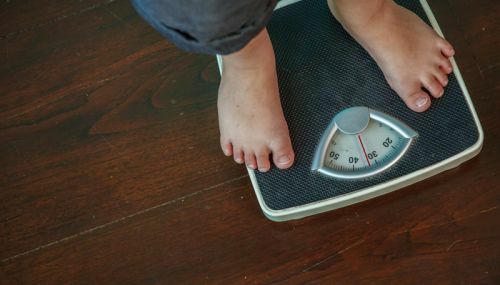 ‘Comorbidity, codevelopment, and temporal associations between body mass index and internalising symptoms from early childhood to adolescence,’ by Praveetha Patalay and Charlotte A. Hardman was published in JAMA Psychiatry in March 2019.